by Lilienfeld, Scott O.; Lynn, Steven J.; Namy, Laura L.
Psychology: From Inquiry to Understanding empowers students to apply scientific thinking to the psychology of their everyday lives. Authors Scott Lilienfeld, Steven Lynn, and Laura Namy introduce six principles of scientific thinking that serve as a clear framework for learning about psychology. As a result of this emphasis on the scientific method, the text helps students develop the critical thinking skills and open-minded skepticism needed to distinguish psychological misinformation from psychological information. In order to provide an up-to-date survey of the field, the Fourth Edition has been updated with the latest findings, coverage of fresh debates and challenges to psychology, and new sections on emerging areas of research. 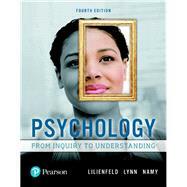 Available to package with Psychology: From Inquiry to Understanding, Fourth Edition, MyLab™ Psychology is an online homework, tutorial, and assessment program designed to work with this text to engage students and improve results. MyLab Psychology is ideal for courses requiring robust assessments. Psychology: From Inquiry to Understanding, Fourth Edition is also available via Revel™, an interactive digital learning environment that replaces the print textbook, enabling students to read, practice, and study in one continuous experience. Revel is ideal for courses where student engagement and mobile access are important. Note: You are purchasing a standalone product; Pearson MyLab does not come packaged with this content. Students, if interested in purchasing this title with MyLab, ask your instructor for the correct package ISBN and Course ID. Instructors, contact your Pearson representative for more information. Scott O. Lilienfeld received his BA in psychology from Cornell University in 1982 and his PhD in clinical psychology from the University of Minnesota in 1990. He completed his clinical internship at Western Psychiatric Institute and Clinic in Pittsburgh, Pennsylvania, from 1986 to 1987. He was assistant professor in the Department of Psychology at SUNY Albany from 1990 to 1994 and is now Samuel Candler Dobbs Professor of Psychology at Emory University and a visiting professor at the University of Melbourne in Australia. He is a Fellow of the Association of Psychological Science and was the recipient of the 1998 David Shakow Award from Division 12 (Clinical Psychology) of the American Psychological Association (APA) for Early Career Contributions to Clinical Psychology. More recently, he received the James McKeen Cattell Award from the Association for Psychological Science for outstanding career contributions to applied psychology and the Ernest Hilgard Award from APA Division 1 (General Psychology) for the integration of psychology across disciplines. Dr. Lilienfeld is president of the Society for a Science of Clinical Psychology within Division 12 and past president of the Society for the Scientific Study of Psychopathy. He is editor of Clinical Psychological Science and until recently was a regular columnist for Scientific American Mind magazine. He has authored or coauthored fourteen books and more than 350 journal articles and chapters. Dr. Lilienfeld has also been a participant in Emory University’s “Great Teachers” lecturer series, a Distinguished Speaker for the Psi Chi Honor Society at the annual APA convention, and a keynote speaker at numerous national and international conventions. Steven Jay Lynn received his BA in psychology from the University of Michigan and his PhD in clinical psychology from Indiana University. He completed an NIMH Postdoctoral Fellowship at Lafayette Clinic, Detroit, Michigan, in 1976 and is now Distinguished Professor of Psychology at SUNY Binghamton, where he was the director of the Psychological Clinic (2007–2016). Dr. Lynn is a fellow of numerous professional organizations, including the American Psychological Association and the Association for Psychological Science, he is a diplomate in clinical and forensic psychology (ABPP), and he was the recipient of the Chancellor’s Award of the State University of New York for Scholarship and Creative Activities. Dr. Lynn has authored or edited 22 books and more than 350 other publications, and was named on a list of “Top Producers of Scholarly Publications in Clinical Psychology PhD Programs” (2000–2004/Stewart, Wu, & Roberts, 2007, Journal of Clinical Psychology). Dr. Lynn is the founder and editor of Psychology of Consciousness: Theory, Research, and Practice (APA), and he has served on 11 other editorial boards, including the Journal of Abnormal Psychology. Dr. Lynn’s research has been supported by the National Institute of Mental Health and the Ohio Department of Mental Health. His research has been featured in numerous media outlets, including the New York Times, New Scientist Magazine, Discover Magazine, CBS Morning Show, ABC’s 20/20, Discovery Channel, and the Academy Award-winning documentary, Capturing the Friedmans. Laura L. Namy received her BA in philosophy and psychology from Indiana University in 1993 and her PhD in cognitive psychology at Northwestern University in 1998. She is now Director of the Center for Mind, Brain, and Culture at Emory University where she is also Professor of Psychology and Core Faculty in Linguistics. She recently completed a three-year term at the National Science Foundation as a Program Director in the Behavioral and Cognitive Sciences Division. She is past editor-in-chief of the Journal of Cognition and Development and a Fellow of the American Psychological Association. Her research focuses on the origins and development of verbal and nonverbal symbol use in young children, sound symbolism in natural language, and the role of comparison in conceptual development.